What Types of Broth Are There? 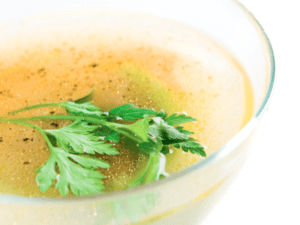 What’s Next for Bone Broth? Let’s cut to the chase, why don’t we? Bone broth is made by stewing bones for anything over 24 hours. It’s made in tons of cultures around the world and even by people as close to you as your grandmother. Bone broth isn’t just delicious, but it’s also nutritious. But that’s not all…if you want the full details on this, check out our full-length article on the benefits of bone broth here. You can add vinegar into your bone broth to increase the mineral content! You might have noticed that collagen is one of the hottest new supplements on the market. People are adding this to smoothies, coffee, and everything in between to ensure they are getting this enough of this important nutrient. Collagen makes up 30% of the protein in your body. It is a component of tendons, ligaments, bones, skin, hair, nails, organs, vasculature, and cartilage. As we age, the collagen in our body is reduced. Our skin and joints become thinner, tendons lose elasticity, bones weaken, and muscle atrophy. This is one reason why injuries are more likely to occur and take longer to heal as we get older. Cellulite, wrinkles, and dry skin are also related to the loss of connective tissue. Here’s the good news – bone broth is incredibly rich in collagen. 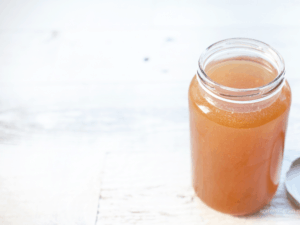 Skip the powdered collagen supplements and make some homemade bone broth! It’s easy, cost effective, and great for your body! The best part about broth is the many different types of them. You can make bone broth from any types of bones. Fish bones, beef bones, pork bones, chicken bones, duck bones and more. Whatever your heart desires. Bone broth tastes very different based on the type of bones you get. You’ll find that the flavor reflects the type of meat or bones that they were stewed in. That said, a rough equivalent (if you’ve never tried it before) is sort of like a healthier, more invigorating version of chicken noodle soup (minus the noodles). 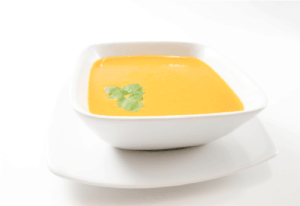 You can vary the tastes and flavors with various spices and vegetables. It’s actually incredible to see what unique favors you can create with the right combinations of add-ons to your broth (pro tip: you should totally try this). 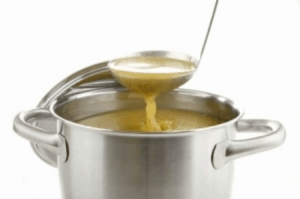 Your goal with bone broth is for it to be gelatinous! Don’t be afraid of the fat. This is where the good stuff lies. That’s all it takes – super simple – just get it set up and let it stew. If your bone broth doesn’t come out gelatinous, there might be a few reasons why. Be sure not to use too much water. You want just enough water to cover whatever you are stewing. For chicken, a good general rule to follow is 3-4 pounds per 4 quarts of water. For beef/veal bones, 7 pounds per 4 quarts of water. You always want to go by the low and slow rule. Don’t let the temperature get too hot. Bring the broth to a slow roll and turn it down to a gentle simmer. For chicken bones, aim for at least 4-6 hours. Beef and veal needs at least 12-18 hours (and up to 24 hours, even). As easy as bone broth is to make at home, sometimes you just don’t want to wait or you don’t have the time. Due to the fact that bone broth is have a resurgence in popularity, it is becoming more and more available to buy at stores and online. Our favorite brand? Kettle and Fire. Kettle & Fire was founded by Justin and Nick – brothers with one mission for their company: to help people improve their health and their lives. That right there is something I can get behind. But I love this broth for more reasons that just that. Broth is only as good as the bones. And luckily for drinkers of Kettle & Fire, they only use the best bones. This means that all bones used to make their broth come from cows that have been grass-fed, pastured-raised and are free from hormone and antibiotic treatment. And they don’t only offer beef bone broth – there’s chicken too! When it comes to making quality bone broth, you need time – and lots of it. Kettle & Fire’s broth is slow-simmered with organic vegetables and herbs (carrots, onions, celery, bay leaves, parsley, and thyme) over a course of 24 hours. Let’s be honest…if you haven’t drank bone broth before, the thought of it can be a little bit unappetizing. I have made my own in the past, and became a big fan of its savory flavor. I’ll admit, though, that I was a little hesitant to drink a pre-packaged broth. To my surprise, Kettle & Fire’s broth was delicious. I heated a cup of it in a small saucepan on the stove until it was warmed all the way through. I sprinkled a pinch of sea salt and ground some black pepper into it and that is all it needed. The flavor was rich, savory, and smooth. I stopped myself at a cup, but I could have easily drank another! 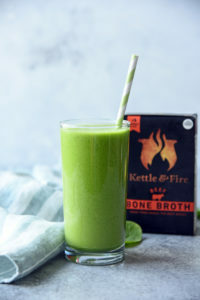 If you want to try out Kettle and Fire for yourself, use this link to purchase your own carton! If you’re in NYC, check out Brodo – a bone broth mecca to keep you warm in the winter. Kobe Bryant used Bone Broth to nourish his body over the last years of his career. If you know of more great Bone Broth locations or information nuggets, let me know and I’ll add to the list!